.......from working in the yard all day. I think I discovered muscles I didn't know I had! I was going to post some flea market finds, but since I didn't get pictures today I am switching gears and am going to share some photos I took when I finished working outside. This is my neighbors red bud tree in full bloom. It is so pretty and full this year. Everything around here is exploding and of course that means a very high pollen count, too. This is very early for us to already be in the mid eighties. I think we skipped spring this year and went right into summer. I saw how pretty this tree looked in the sunlight and grabbed my camera, which I still need to learn, and just started snapping photos on different settings. A little friend showed up for the photo shoot, too. These are our hostas coming up and this big already. I do not know the name of this little bush/tree. It gets these blooms and then they fall off and the leaves come out. Hanging basket I just bought yesterday. I am joining the Mosaic Monday meme over at The Little Red House hosted by Mary. Please be sure and click on the link and check out all the other mosaics this week. Now, I need to go get a nice hot shower and take some advil to get rid of all this muscle pain. We have one hundred bales of pine straw coming in the morning and that is why I had to get a lot of things done today. This old body of mine is just reminding me that I am no spring chicken any more!! I hope you drop me a note and let me know you came by. I appreciate your comments more than you know. The pictures are great Kim! Our redbuds are just starting to open up here but the Bradford Pears are full and so beautiful this year. It doesn't always happen on Easter, but this year the blooming of the forsythias, daffodils and Bradfords have come just at the right time. Thanks for sharing your pictures with us- they turned out great! I think your pictures turned out great! I can't believe how big your hostas are already. (That sounded a little strange, didn't it? Ha!) I wish mine looked like that. Mine are just now sprouting through the ground. That red bud tree is beautiful! Today was sooooo hot! We celebrated Easter at Jimmy's cousins house and ate a big dinner. Then the kids had a huge Easter egg hunt. They own alot of property and it was just beautiful (but hot). I know you must be tired if you worked outside today. You can send some of that excess straw over my way if you have any left. Ha! I bet your yard is looking pretty now. beautiful, I love red bud trees. I might try a few in our yard and see how they do. I think they grow slowly. Enjoy and take a long slow soak in the tub for the sore muscles. Bubbles always help too and glass of wine! Wow...what gorgeous color! I love the spring buds on the beautiful tree! Your mosaic is wonderful! I just adore all of the beauty that springtime brings...even if we have to help it along a little bit;)! I love all of your wonderful pictures and I hope you get a nice relaxing bubble bath as a reward for all of your hard work! You're redbud is so pretty. Mine in Illinois is just starting to bloom. I was on my hands and knees for 1-1/2 hrs solid pulling weeds,and then hauling to the pile with the pitchfork, so that was all I wanted, but of course, loving being in my beds and the great weather. This looks great! I just love working in the yard all day! 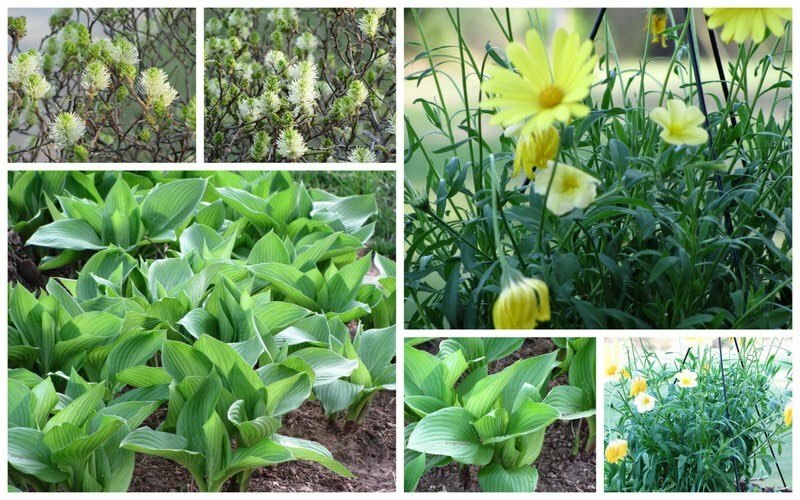 Your hostas look wonderful, I love that you group them together like that! I need to add more to my collection! What beautiful photos- I especially love those with the bees! I feel like summer might get here, eventually, in cold rainy Oregon after enjoying your photos. Those are beautiful pictures! Kim, these are all beautiful! Our Hosta's are just little nubs coming up out of the ground. Hopefully they'll look more like yours in a few weeks. What a beautiful tree all in bloom! Gorgeous pictures. Our red bud just started blooming and today I spotted the hostas making their appearance. I L-O-V-E Spring!!! It looks like you are doing great with your new camera. I love shallow deep of field photos where the back ground is blurry. Thanks for the beautiful spring photos. I think Savannah was late because it is further south? We were driving up from Florida where their "spring" was really late. I think the cold weather mixed everything up. 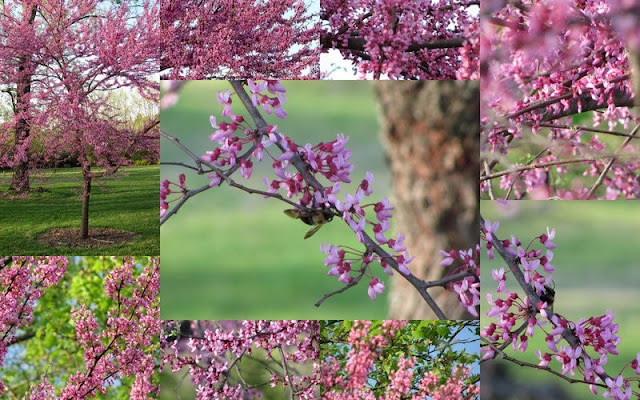 Thanks for the beautiful red bud pictures..I had forgotten what that tree is called and we marveled at it's beauty all over town today. Have a great week! You are doing very well with the camera, the photos are great. The mosaic is beautiful, thanks for sharing and have a great day. I knew from the title that you were going to tell us that you had been working in the yard. I love hostas. It grew great for us in Georgia. Do you think it would grow up here in northern Kentucky? My hubby is off in a couple of weeks and we are going to start planting some new things. We don't have anything planted since our home is new. We won't live here (probably) for over 2 or 3 years and I am not going all out like we normally do. What do you think about the Hostas? Absolutely LOVE the red bud tree in front of the bright green leaves of the other tree! Love your pictures! I need to get outside and take some of ours!! Wonderful scenes and delightful blooms! Wow what a beautiful spring! Love those pictures! Beautiful photos, Kim! What will you be doing with 100 bales of pine straw?? You have some lovely plantings & your captured them beautifully. Isn't Spring wonderful?! Ours is a few weeks behind you Southern belles but we'll get there. I am loving all your PINK trees!!! That blossom is just beautiful! Beautiful photos of all your blossoms, Kim.. I lost all my hostas, so I'm super jealous of yours :-) Got any tips to pass on as to how to make mine live this year? Love all your spring time pics.. They make me wanna go outside and plant plant plant..
Beautiful photos. Seems like my Hosta's are bigger than normal this year already too! Advil does wonders, doesn't it ; )! Oh my goodness...I just love your mosaic! I hope that you have a wonderful new week! Kim, Your pictures are beautiful! I just love this time of the year! So beautiful! We are having very warm weather too already - around 90 today. I have been outside today some working in the yard and have got to do some planting. May have to make a trip to Lowes to get some pretty flowers! Such beautiful blossoms and great mosaics. hve a nice day. Beautiful!! You are doing great with the camera. Our redbuds are just beginning to bloom..the Bradford pears have bloomed and already quit.. Thanks for letting me know why my biscuits didn't rise as much as with white flour. They sure tasted good..I love whole wheat. Guess I'll add a little more baking powder the next time. I love your photos. Beautiful. I love hostas, but they struggle here - we're one zone too far for their liking. Looks like they'll be abundant and lush in your garden this year! The redbud is gorgeous and I can't believe how much your hostas have unfurled already. Mine are poking through, but are still pointy and wrapped tight. Spring is so magical -- there's something new to look at each day. Hope your tired muscles are relaxing and forgiving you for overdoing it.